Reading and share top 3 Lorna Crozier famous quotes and sayings. 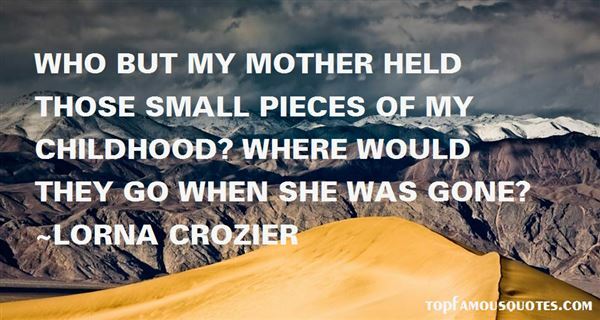 Browse top 3 most favorite famous quotes and sayings by Lorna Crozier. 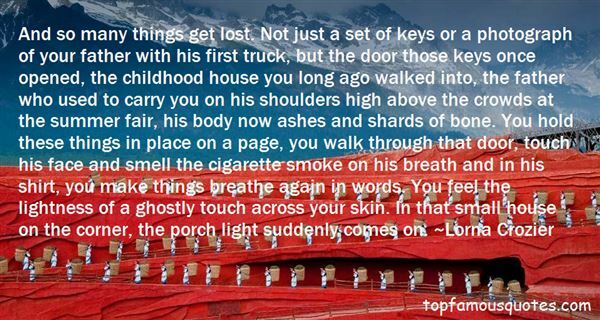 The future wafts in and out of my world like a ghost - like a lumbering beast, begging to be tamed. For so long it sat locked in mystery, surrounding me, fickle as the wind. I see it now for the noose it is, the game that never satisfies, the warrior that always kills.The past proved to be set in stone, the immovable rock of my existence that cast its shadow into the valley of death. But it is the future's bright light that draws me in, the blinding rays that pull me forward with bionic, magnetic, force. They row me towards my destiny with indescribable power, to a fate questionably determined - washed in the patina of hope."